Shower faucets are one of the most important components of bathroom designs. Thanks to technologies we have a large variety of them to choose from. So if you’re thinking of re-modelling your bathroom; give it a traditional or modern look however you want, to replace shower faucets are a given. That aside, if your shower faucets are giving you troubles you might consider changing them as a wise choice. 1 How to Replace Shower Faucet by Yourself? How to Replace Shower Faucet by Yourself? One replacement should last long enough to make you forget about its previous troubles. If you’re thinking on how to replace shower faucet at home, this is just the post for you. It requires actually nothing but a replacement kit and no need to redo your shower valve plumbing too. So just grab the equipment needed and a friend if you need an extra hand and get to work. Single handle shower faucets are used the most in homes and are very popular. It allows the user to control both; water flow and temperature with a single control. This design is quicker to adjust the temperature and water pressure to your desired level. ​Two handle designs provide a more of a traditional look. It offers two separate handles for hot and cold water. ​Three handled shower faucets have a unique design that contains two shower handles and a diverter. The diverter serves as a conductor of the water flow; you can divert the flow from tub faucet to the shower head. You might face various problems with an old shower faucet. Some so grave that you will have to replace that. But some you could repair by yourself. You’ll need to open the shower handle to fix this. Then remove the escutcheon and you’ll see the spout behind it. Grab an adjustable wrench and give it a slight rotate to loosen it a bit. Then reassemble the parts as before. The solution is usually the change of handle, but you can extend that time a bit by winding Teflon tape around the faucet stem. Follow this post till the end for the solution to this problem. To replace a shower faucet by yourself at home, you’ll need to follow some specific steps. When you do, you’ll see it’s actually quite easy and also fun since you’re saving money too. No matter what kind of shower faucets you’re replacing, the basic steps are almost the same. ​First, you need to choose a shower faucet to replace the older one. There are various types of shower faucets available in the market. You need to choose one fitting for your bathroom. It doesn’t have to be an exact replica of the previous one, all you need to be careful about is, that it fits. ​Apart from the new shower faucet components, you’ll also need some other equipment to set them up. Container to hold water if leaks. And a towel to wipe the remaining water off. Gloves and safety goggles, in case you’re going to need a cutting through the wall. ​Turn the water supply of the house off. Or you can use the main shut off valve to stop the water flow. It should be located near the tank on the main outlet pipe. It is an important step before you start replacing the shower faucet. You wouldn’t want to face serious water damage to your wall in the process of replacing the shower faucet. ​To keep your bathroom floor stain free and clean it is necessary that you cover the floor with a cloth or canvas. So you won’t harm the tiles while working, also it’ll prevent losing small parts i.e. screws. ​Typically the faucets have a removable cap which covers the screw of the handle. You’ll need to slip a flat screwdriver in to pop it off. You’ll see a screw beneath it, unscrew it counterclockwise and hold the shower handle carefully during the process. If the screws are rusty give a bit extra effort or use penetrating oil. Then pull it off from the shower mount. Do the same with other shower faucets. ​Slide a flat head screwdriver behind the escutcheon and gently press it away from the wall. An escutcheon is what covers the opening hole of the wall behind the handle mount. Keep it with other parts that are to be discarded. 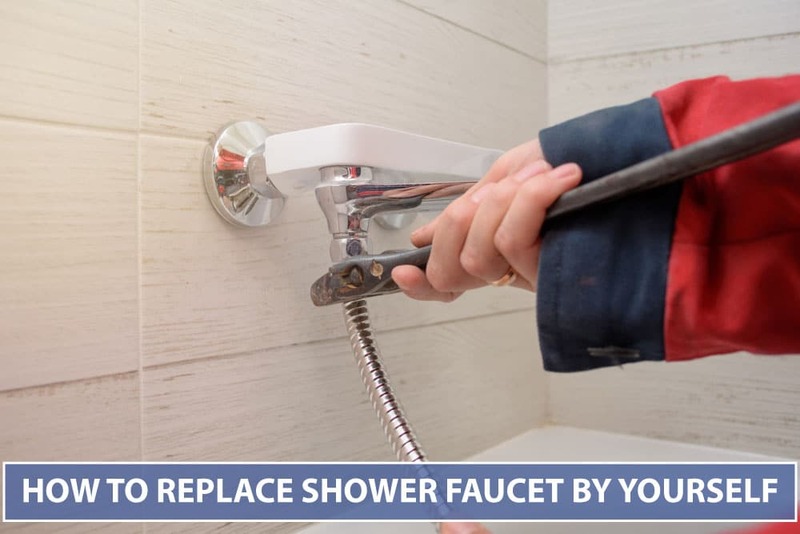 ​Removing tub spout may need both your hands and even an adjustable wrench to undo it. Twist it counterclockwise gently and pull it toward you at the same time. If your faucet’s diverter handle has an arrow on it, use a flat head screwdriver to tip it off and it’ll reveal a screw. Before removing that, make sure that you’ve opened the valve completely. Then, use a slip-jaw pliers to pull the shower handle faucet straight out of the wall. ​More than half of the work is almost done if you’ve been following me till now. Wipe clean the dirt and old caulk off the wall before installing new components. ​Now you need to go in reverse order of what you’ve been doing to install new parts. Insert a new faucet post and a new screw to secure it again for a long enough time. Use an adjustable wrench, and then mount the new escutcheon. ​After setting the escutcheon up, rotate the screw of the shower handle clockwise with Philips screwdriver as tight as you can when done cover the screw of shower handle with the removable cap provided. Replace the other shower faucets in a similar manner. After successfully replacing the shower faucet, all you have left to do is finish cleaning up the mess. Collect the discarded parts to dispose of them. And carefully wrap the cloth up so that no fragments of wall or tile make a mess of the bathroom. Clean the canvas afterwards. Of course, you’re familiar with this gross phenomenon if you have hard water. Who likes the damn sight of calcium build-up on shower faucets! If you ignore cleaning them much there will be a crazy amount of build up on faucets. So clean them regularly if you want your shower faucets to last more and give you better service. If you want a quick clean up procedure, you can try the traditional plastic bag way. Fill that with distilled white vinegar or a mixture of CLR and water, place it over the shower faucet and secure it with a few loops of a rubber band. Leave it for a few hours like that, and then remove the bag. Do remember to wear safety PVC gloves. Grab a magic eraser or a scrub brush, both will work the same and scrub the residue clean. Then rinse the chemical off with a cold sharp flow of water. For handles and trim plates, soak paper towels in the solution then wrap it around the handle, the rest is same.